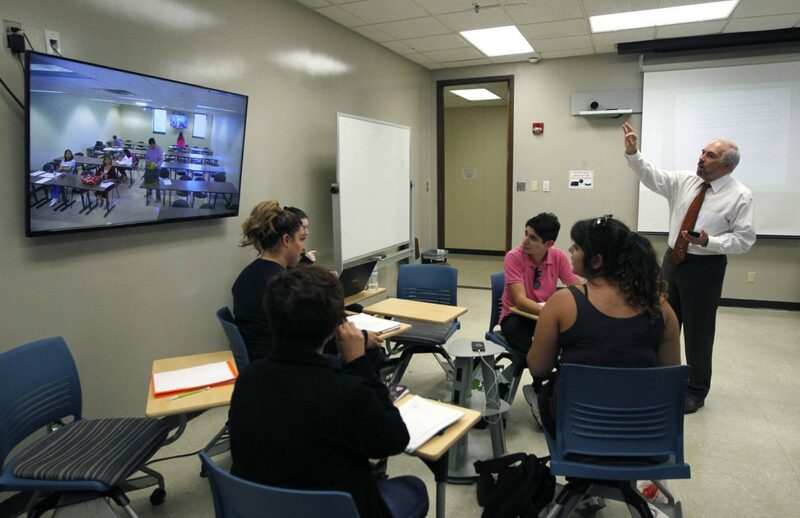 University of Texas Rio Grande Valley President Guy Bailey, right, talks to students attending his linguistics class at the Brownsville campus via a television and audio system Tuesday October 17, 2017, from his classroom on the Edinburg campus. Bailey insisted he be able to continue teaching while president of the university. Bailey trades off teaching the class from either the Edinburg or Brownsville campus. EDINBURG — A small briefcase containing paperwork, a laptop, cellphone, and more than likely a Diet Coke are some of Guy Bailey’s essentials for his daily commutes across the Rio Grande Valley. As well as an extra suit and tie in case of an impromptu meeting or event. “If you like order and always knowing what’s going to happen, this is the wrong job for you,” Bailey said of his role as founding president of the University of Texas Rio Grande Valley. Ever since Bailey, 67, assumed leadership of the university in May 2014, he has become accustomed to constantly traveling the many miles dividing UTRGV’s campuses. The Brownsville and Edinburg campuses house his main offices, but they are 60 miles apart and only hold the essentials — a desk, a video conferencing system and, if he’s lucky, cookies from someone aware of his sweet tooth. Everything else fits in a suitcase and travels with him. On one particular Tuesday morning, Bailey’s day began with meetings in Brownsville and Harlingen. Because his vehicle was undergoing repairs, however, Jose Gonzalez — a UTRGV police officer assigned to drive the president when needed — gave Bailey a ride to and from. Work started during the hour-long drive between Edinburg and Brownsville with phone meetings. “Our retention rates should be better than at UTSA and UTEP,” he said in discussion with UTRGV Vice President Janna Arney. His cellphone is always charged and at hand to help make sense of the fluid nature of his ever-changing schedule, which is mostly managed by his Edinburg-based secretary, Maria Conde. UTRGV’s scope is widespread with two main campuses — formerly known as UT-Brownsville and UT-Pan American — as well as the newly created School of Medicine. Then there are the several teaching centers and labs spread throughout Hidalgo, Cameron and Starr counties. Travel is the only constant in Bailey’s schedule as he aims to be on each campus at least once a week, and there are many out-of-town meetings. The 2016 Chevrolet Suburban driven by Gonzalez has already accumulated more than 18,000 miles, and Bailey’s personal truck, a 2016 Nissan Titan bought in April of that year, has more than 31,000 miles. In between meetings he tries to sneak in a quick lunch and despite efforts to maintain a healthy diet, he sometimes relies on protein shakes he keeps in his office fridge or fast food. His go to, if needed: Chick-fil-A. Bailey’s job, as he describes it, is not only to be the face of the university, but to oversee every aspect of it — from the academics, to athletics and overall growth. Any given day he might hold meetings with enrollment and leadership staff from every department, and tuition committees. But another significant part of his time is spent advocating for the interests of the university, which include meetings with area legislators and potential donors. The Valley, as it turns out, doesn’t have a strong philanthropic culture, so one of the biggest challenges has been to rally supporters to afford programs not fully funded by federal dollars, such as residencies or community outreach programs. During the first few years of the university’s existence, UTRGV raised $28,417,340 its first year and $33,652,234 in its second — this compared to its legacy institutions raising $2,959,381 and $6,125,978 in 2015 and 2014, respectively. At the time, the decision to take over the monumental task of helping create a new university didn’t come easy for Bailey, who at the age of 63 and after the 2013 death of his wife, Jan Tillery-Bailey, was thinking of retirement from administrative roles to instead focus on teaching or research. After being approached by UT officials, however, he admits to being tempted to take on what he considered one of the biggest challenges of his career. He’s previously served as president for the University of Alabama and Texas Tech University, as well as other leadership roles that included serving as chancellor of the University of Missouri-Kansas City and as provost of UT-San Antonio. Still, he knew that leading UTRGV would be more demanding. The truth is that he was waiting for a challenge of this magnitude before formally retiring from administration. The notion of hiring a founding president that is nearing retirement has, like anything, pros and cons. For instance, there was a chance he might have only remained in the position for the establishing period. And this may still be the case considering the enormity of Bailey’s duties, but he never put a time-frame on his tenure at UTRGV. But when it comes to navigating challenges, experience carries weight, and Bailey is unlike others who may have seen UTRGV’s presidency as a stepping stone. Dr. Cigarroa, a transplant surgeon from Laredo, was leading the system during UTRGV’s genesis. On top of looking for experience, he said UT was looking for a person that saw this as a unique opportunity to impact higher education. Bailey’s background and a positive interview with the regents placed him right at the top of the list of candidates, he said. Cigarroa believes Bailey was and continues to be the perfect choice as UTRGV’s founding president. On Tuesday afternoon, Bailey stood in front of about 25 students at the Liberal Arts building in Edinburg, where he has been teaching the History of the English Language to students who may pursue a career in his field of linguistics. The class was transmitted live to students in Brownsville on this particular day, but he alternates campuses each week. Despite his chaotic schedule, Bailey said he took up teaching again during the spring of 2017 as a way to remain connected to the students. This means his Tuesdays can begin before 8 a.m. and end at around 7 p.m. But what’s important, he stressed, is getting a sense of how this unique university is helping students progress. As he walked out of the classroom Tuesday evening, Bailey recalled the first time he taught this class in 1979 at Emory University. He was only 29 years old at the time, and he had just decided to grow a beard to appear older. Bailey hasn’t parted with it since. His teaching style has had to adjust over time to accommodate several generations of students, which he said is the same idea for university leadership. While UTRGV’s nuances are unique compared to other universities he’s led, the goals must remain consistent. In this case, such goals include reaching the Emerging Research University status to bring more resources to the area, not to mention increasing student enrollment and decreasing graduation time. Now that the university is achieving a more solid standing, nurturing continued growth and development will be necessary to ensure UTRGV’s place among the top educational institutions in the state. On the subject of a looming retirement, Bailey said he plans to let his mind and body tell him when it’s time to step back and focus his attention solely on teaching and research, both of which he continues to practice.